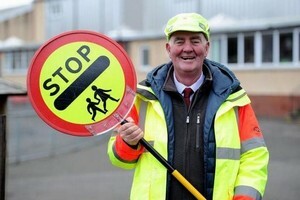 A much-loved Paisley lollipop man has retired after almost 10 years on patrol at Bushes Primary School. John Foley, a former firefighter, has been working on the crossing outside the Glenburn school since January 2009. He’s made a big impact on the school community and even won Lollipop Person of the Year awards for both Scotland and Britain. John, who lives in Renfrew with his wife Kathy, was forced to take early retirement from Strathclyde Fire Brigade after 18 years service when he was diagnosed with the chronic fatigue syndrome, ME.